Hi! It’s been a while, I know. If you have been following along on Instagram then you know that the last week has been SO busy. It included a quick trip to LA, meeting Tiffani Thiessen and an indulgent conference in Portland. I was only home for a couple of days last week which didn’t leave much time for blogging. 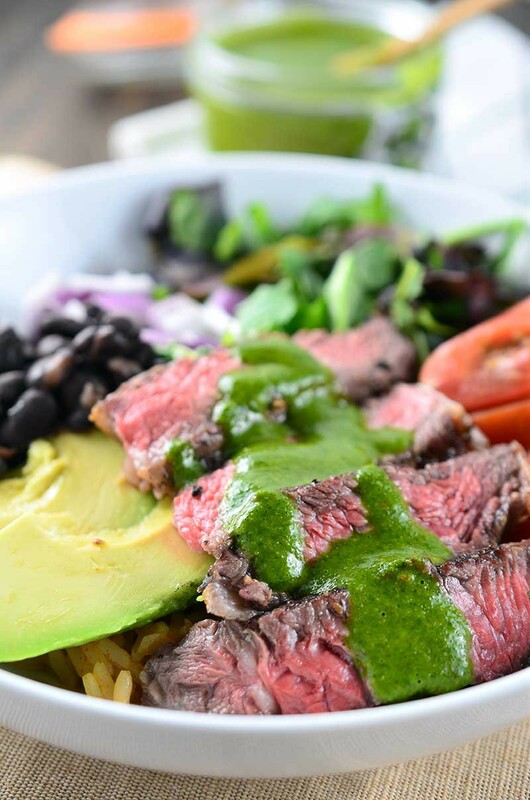 Now that I’ve got a minute to catch my breath, I’m finally able to share this Chimichurri Steak Bowl with you. And guys, I’m pretty sure you’re going to love it. Is it just me or are bowls every where now? It seems every where I turn people are throwing something in a bowl. Not just cereal and soup. But smoothies, tacos and burritos. It’s actually a pretty awesome idea when you think about it. You can add so many different ingredients. Tons of veggies and protein. They are just so versatile. And seriously, with all of the different ingredients you get so many different colors and they are just so pretty. For my entry to the “everything in a bowl” scene, I decided to make this Chimichurri Steak Bowl. It’s loaded with steak, black beans, rice, avocado, tomato, red onion, lettuce and, my favorite part, chimichurri sauce. This Chimichurri Steak Bowl came together when it hit 60 degrees a couple weeks ago and I decided that that meant it was time to grill. 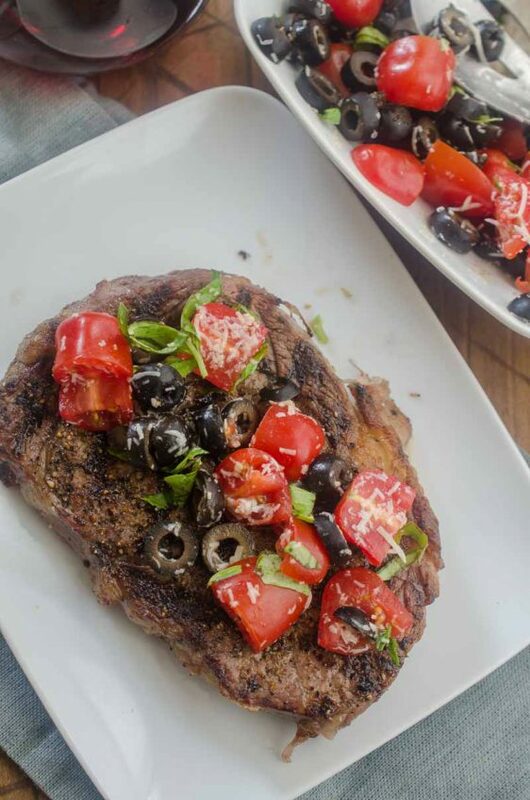 I used a ribeye steak because I was looking for a tender cut that didn’t need to be marinated. I was also able to stretch the 1 pound of steak by slicing it thinly before placing them in the bowls. When it comes to assembling the bowls, there is no right or wrong way to do it. I was taking photos so I wanted to make sure to show off each ingredient. To do that I simply placed the ingredients next to each other the bowl and drizzled the chimichurri over the top. You can simply pile everything into a bowl if you like. 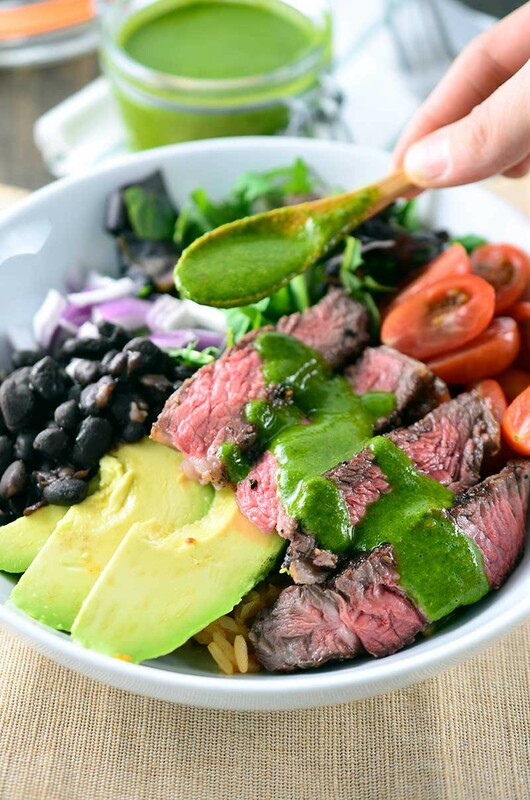 Either way, this Chimichurri Steak Bowl made for the perfect quick, easy and delicious weeknight dinner. Make the chimichurri sauce first. Place cilantro, parsley, kosher salt, cumin, white wine vinegar and crushed red pepper in a food processor. Turn food processor on, while it is processing slowly add in the olive oil until the mixture emulsifies, about 1 minute. Let set at room temperature until ready to use. Sprinkle the steaks liberally with salt and pepper. Heat gas grill over to medium-high heat. 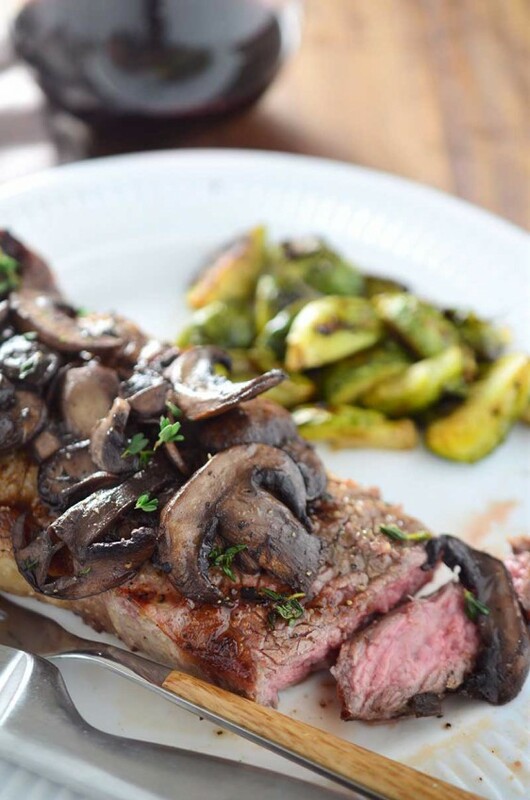 Cook steaks 3 - 4 minutes per side for medium rare. 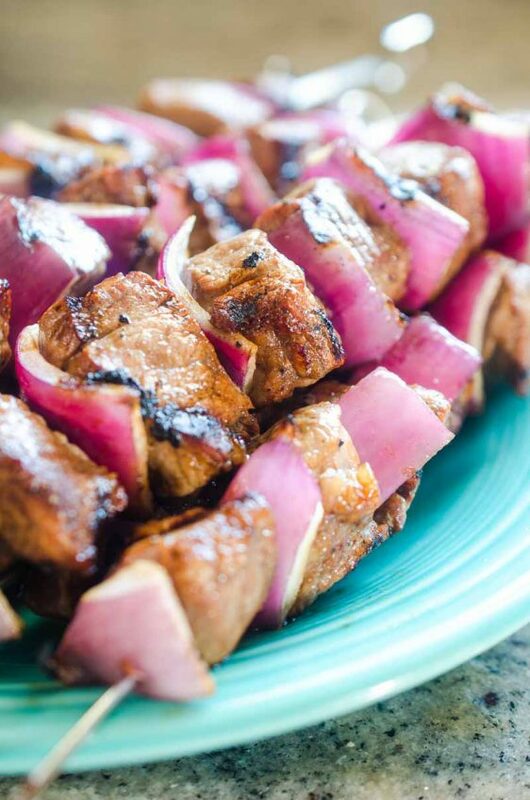 Transfer to plate and let rest for 10 minutes. While steak is resting, heat black beans in a pan over medium heat just until warmed through. To assemble the bowls: Working in a circle, spoon rice and beans into the bowl. Place tomatoes, onions, avocado and lettuce in the bowl. 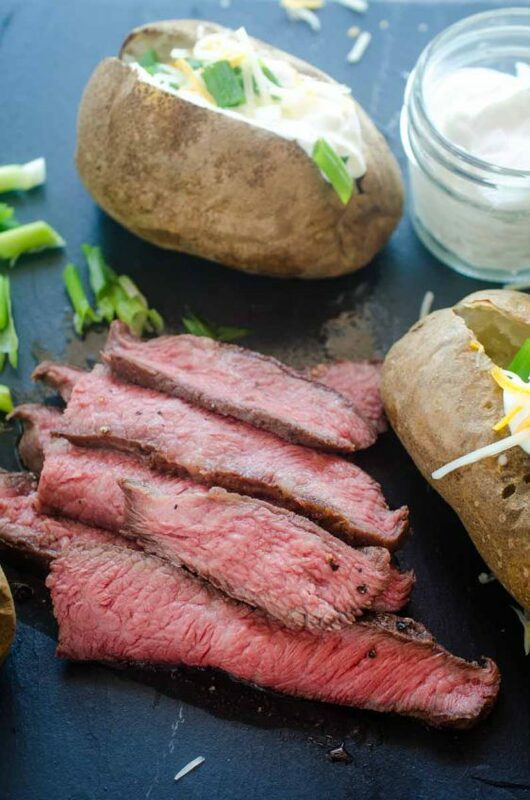 Slice steak and lay across the bowl. Spoon chimichurri sauce over the top. Serve. You had one amazing week! Lucky girl! This salad, though. I want it for lunch. Like, today! 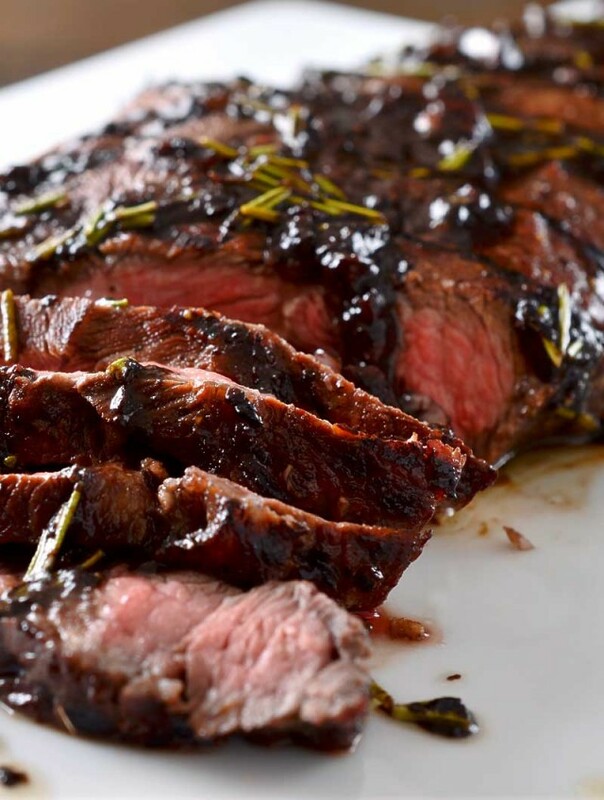 I love chimichurri sauce! It adds such a great flavor profile! Gorgeous salad. I’d love it for dinner tomorrow. This looks so, so good. All those great flavors in one bowl, yum! Chimichurri is the best! Love all the gorgeous color in this bowl. I’ve been looking for a new recipe to spice up Mexican night because a girl can only eat so many enchiladas. Can’t wait to try this recipe! 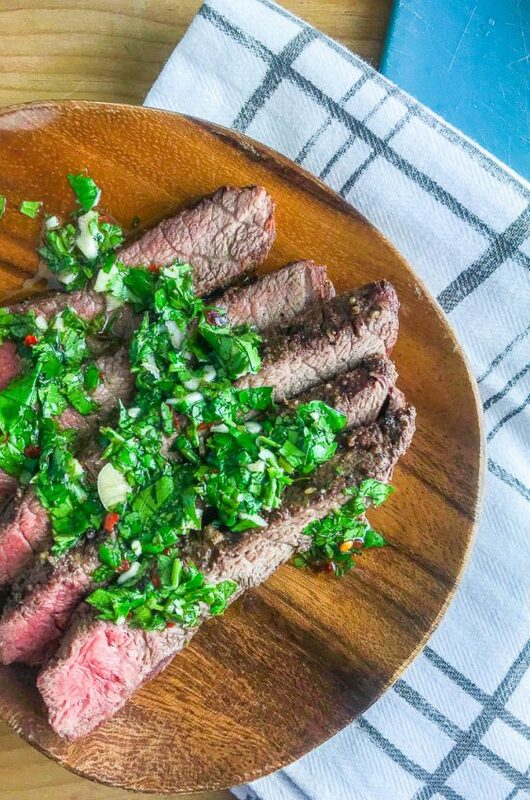 Chimichurri sauce is the best and this recipe is just in time for Cinco de Mayo!